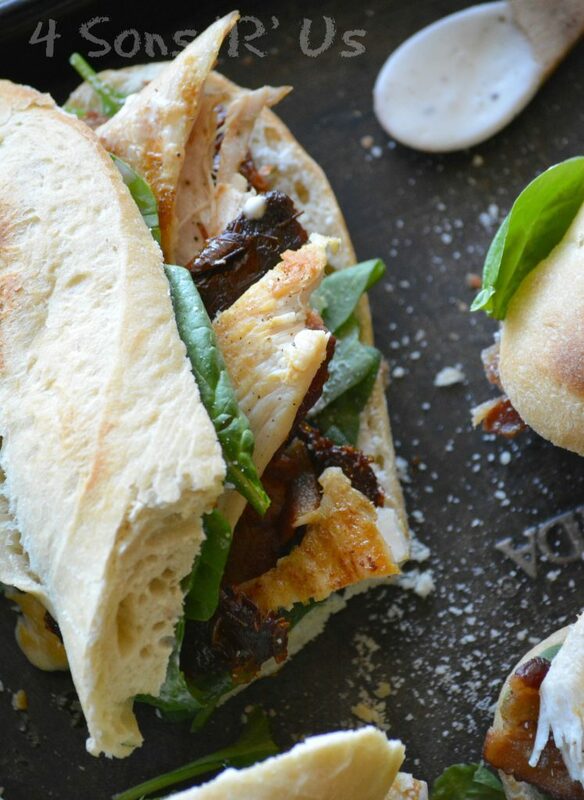 Sandwiches are a lunchtime staple. 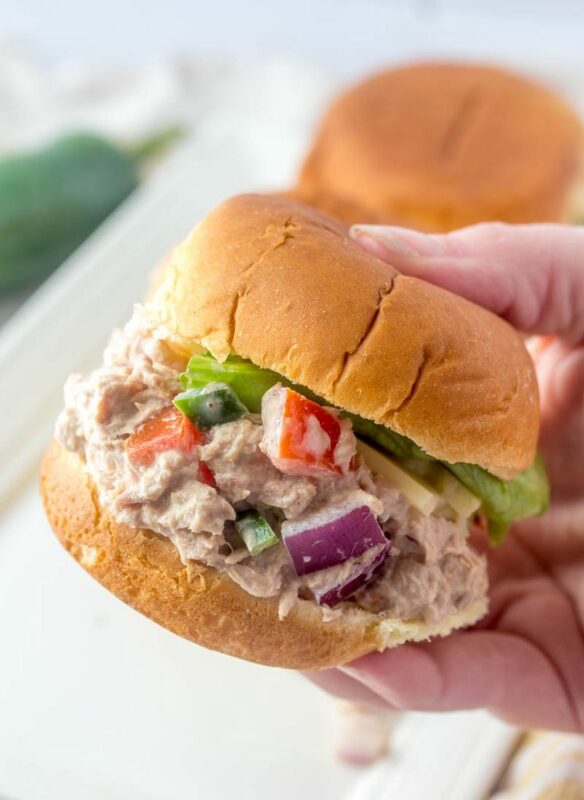 Sub sandwiches are often brown bagged, but just as often an easy appetizer for parties or anytime you’re hosting a crowd. Here we’re no strangers to the game. We brown bag it, often in fact because while my husband works a respectable job, at the end of the day- he’s still in construction. His lunch breaks are really rigid leaving him with few options, and when he can leave the job site can be even more limited. So I have to find ways to pack him a hearty lunch, and things that are budget friendly to go in them. Things we can both agree on. Not gonna lie, despite loving each other fiercely- the agreeing on things doesn’t happen all that often. 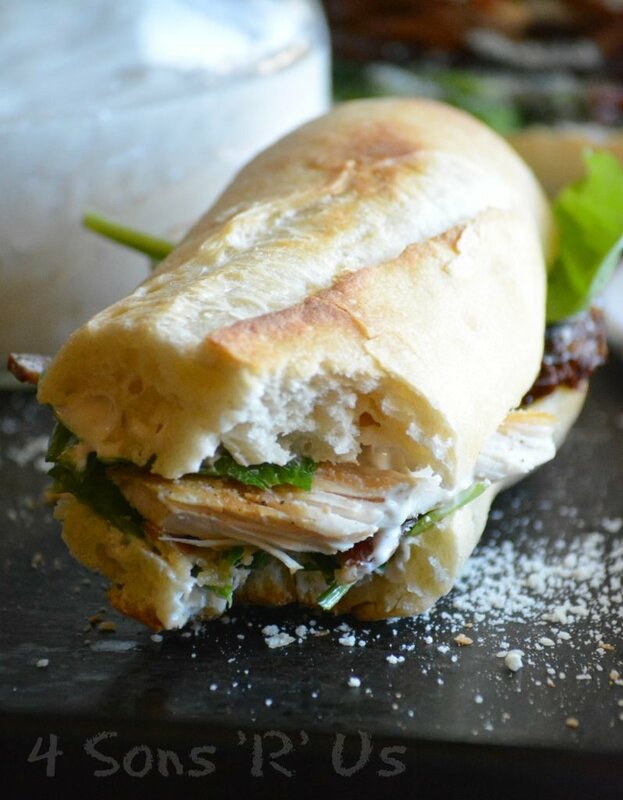 Luckily, we can always agree on this Chicken Caesar Club Style Sub Sandwich. It’s too good to pass up, chock full of fresh ingredients bursting with beautifully paired together flavors. The ‘club sandwich’ isn’t a brand new thing, not even from the last century- there are references to it verified as far back as 1899! 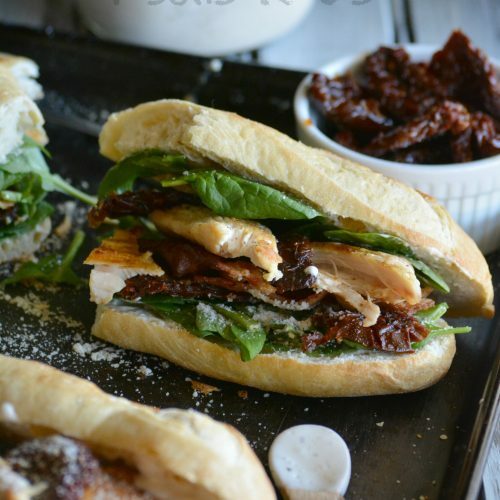 Traditionally, it was a sandwich served on two pieces of warm/toasted white bread with thick layers of each ingredient- cooked, sliced chicken, fried bacon, crisp lettuce, and juicy slices of tomatoes all slathered in a yummy spread of mayo. While the traditional version usually includes an extra (third) slice of bread and separate layers, it’s clearly withstood the test of time. As with everything else we make, we took that version (made a couple of swaps and substitutions) and turned it into the sandwich you see today. 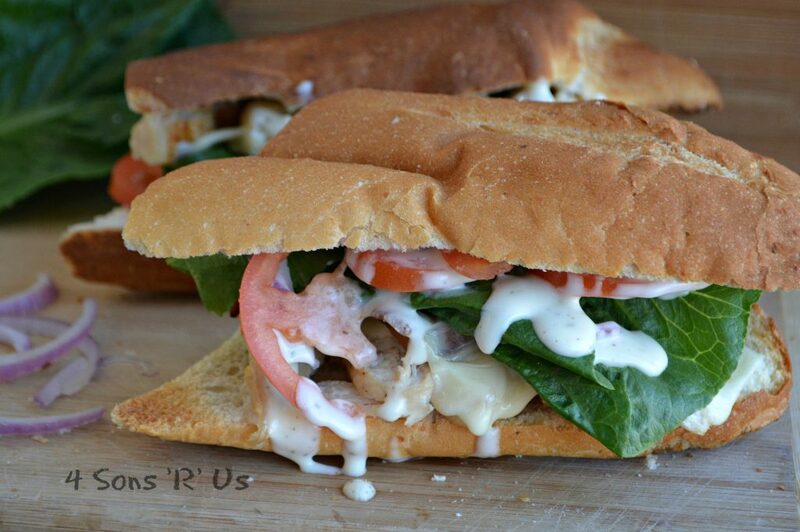 This Chicken Caesar Club Style Sub Sandwich is basically just a fancier spin on the tried & true classic. Still on a budget, still with easily accessed ingredients. But a delicious change up in all the right ways. It’s still totally filling (you’ll actually be excited about packing your lunch if this bad boy’s in it), and while yes it’s just a sandwich- it’s the best dang sandwich you wouldn’t ever believe you made yourself- at home! We may have changed things up, putting a fresh spin on things, but we didn’t get too crazy with it. The basic ‘works’ are still the same. We traded the lettuce for leafy green baby spinach. The typical vine ripened tomatoes became sun-dried ones. Obviously, we didn’t mess with the bacon. Crisp bacon is always a must, and makes everything better. We left the chicken, but instead of the sliced sandwich variety most people favor- we opted for some grilled breasts, slightly torn apart. The traditional mayonnaise? Yeah, we left that stuff at home and opted for a rich, creamy spread of Caesar dressing. Instead of white bread, we went for the classier (and heartier) baguette. And in addition to the salt & pepper, we sprinkled on some grated Parmesan cheese, because you can’t have chicken caesar anything without the parm. It’s a rule- unwritten sure, but just as mandatory. 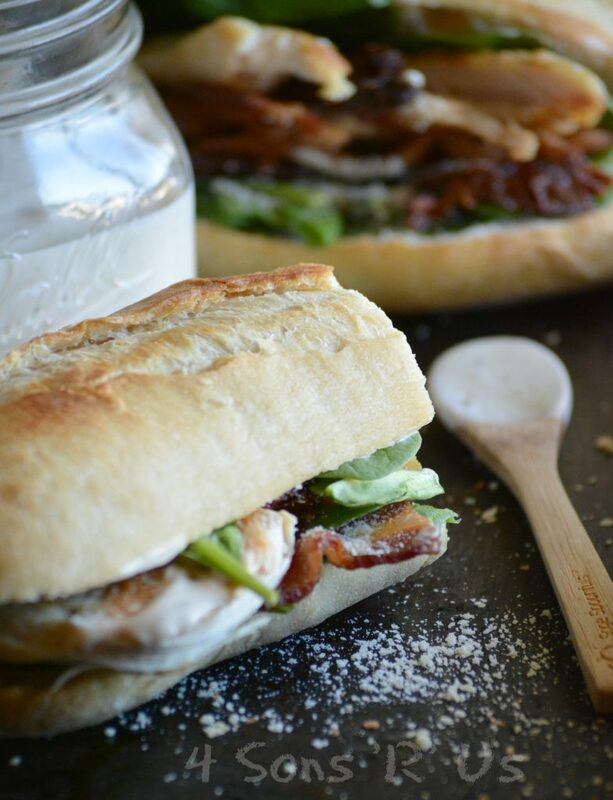 Step up your lunch game, or whip up an easy sandwich destined to impress, with these quick and easy Chicken Caesar Club Style Sub Sandwich. Your partner will thank you for it, and think you broke the bank, and actually went to trouble making it. 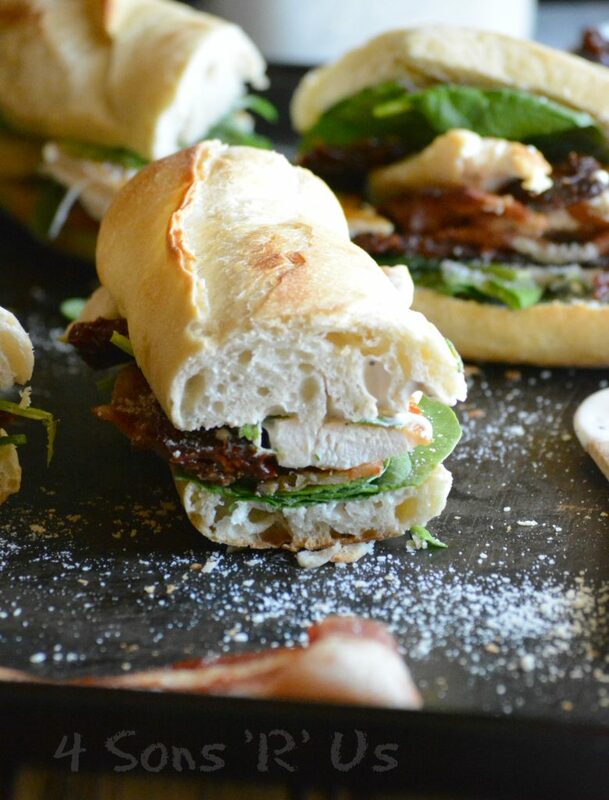 A fancier spin on the traditional club style sandwich, we skipped the layers and made a few substitutions to create something truly gourmet that works on anyone's lunch budget. Heat the oven to 350 degrees. While the oven's heating, slice the baguette in half lengthwise. Divide the butter, and spread out evenly over each inside half of the baguette. Place the baguette on a baking pan, cut sides up, and bake for 5-7 minutes, or just until lightly toasted. When the bread's cooled slightly, spread both sides generously with your favorite Caesar dressing. Don't skimp- you don't want it to all squeeze out, but you'll want the flavor and the moisture. On the bottom half of the bread, layer a bed of spinach leaves. Top that with the drained tomatoes. Sprinkle on Parmesan cheese. Add the bacon slices, then the chicken, and salt & pepper, to taste. Top with another layer of spinach leaves, then the top baguette half. Slice, and serve immediately, or seal and refrigerate, up to 12 hours before serving. 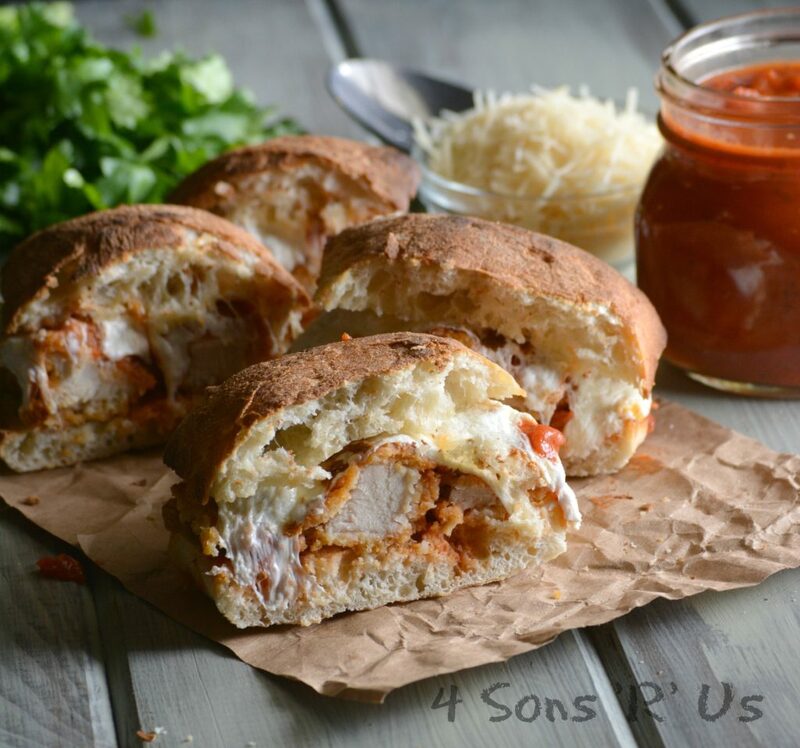 Your recipes are so great I love getting them in email… I really like the one’s today…Caesar Club Style Sub Sandwich!! Just wanted to say you have been giving me a lot of New idea’s Thank You so much..
Yum, your photos are making me hungry! 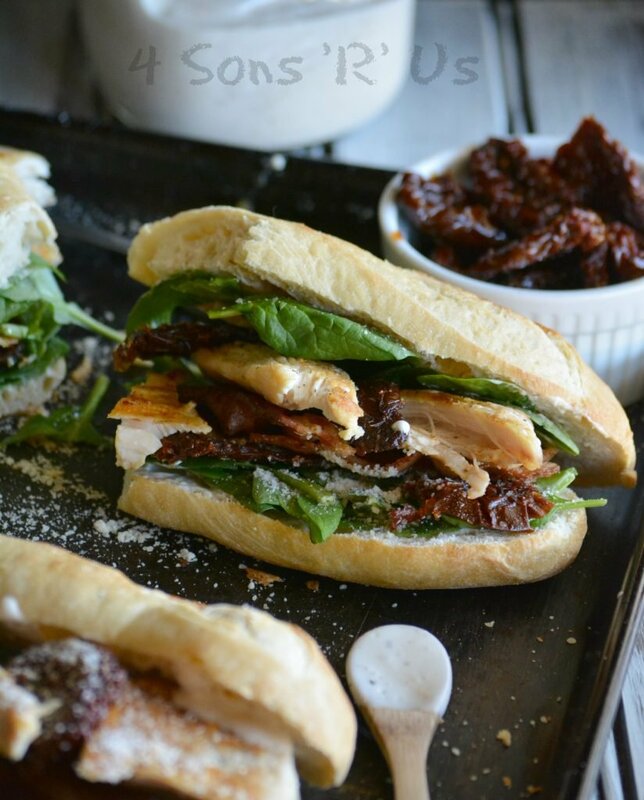 I like the addition of sun-dried tomatoes to this sandwich. 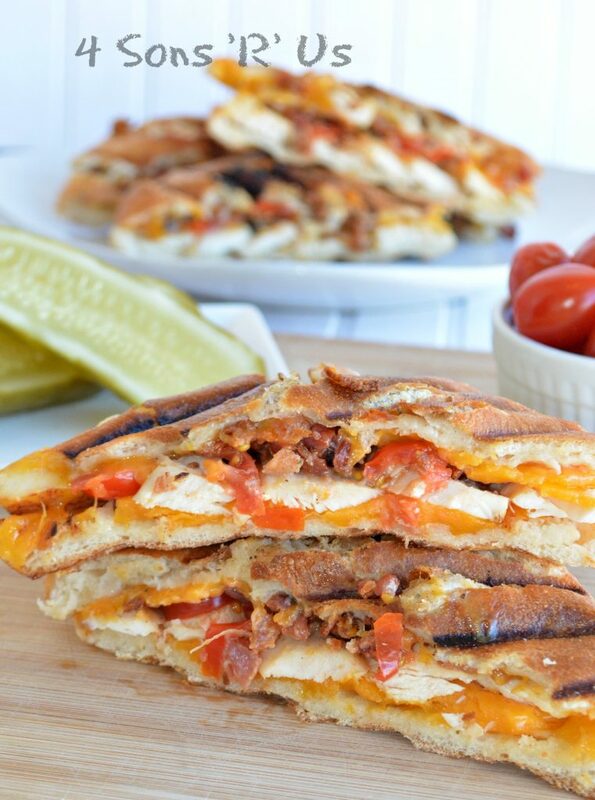 Lunch is a meal that I often neglect, but this sandwich makes me want to definitely try it! Thank you for sharing at Fiesta Friday!